We recently held a webinar with Dennis vanEngelsdorp from Bee Informed Partnership (BIP)(below is the link to the recording). BIP is a five year project which is focusing on which management practices have less winter loss. 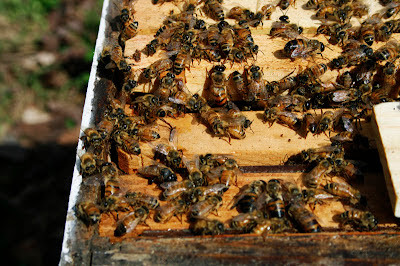 Information from anonymous surveys, taken by beekeepers, are analyzed and formed into reports that are posted for public review. These reports hold data that interpret different management practices to the amount of winter loss.The success of this project and these reports hinges on beekeeper participation. Ever since varroa, beekeepers have been looking for the "Silver Bullet" to solve our winter loss issues. Well, there is no "Silver Bullet" product that will do the trick but this survey and the results which come from it is the closest we are going to come. 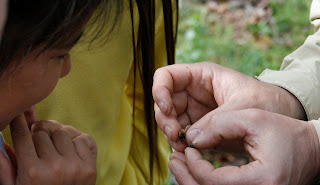 As beekeepers, we have a vested interest in this project and should participate in the survey. Stop waiting for some magic product, be part of the solution. Participate Now by Clicking Here. Still not convinced? Here is a sample of one of the 200+ reports that will be released. For those who were unable to join the webinar we have uploaded the Broadcast or check out Bee Informed Partnership for more information. In recent years there have been numerous claims that a class of pesticides know as neonicotinoids is the cause for Colony Collapse Disorder (CCD). While they have been shown to have a detrimental effect on colonies, few are saying they are sole cause. Just within the last week there have been a few studies that provide insight into just how detrimental. The first two were released on the website for the journal of Science. Both studies looked at the sub-lethal effect of pesticides and levels which they are exposed to in "the wild". They first found that exposed honeybees were 2-3 times more likely to die while away from the hive than the untreated bees. This finding as well as others suggests that they are unable to navigate home. The second study was similar but used bumble bees. 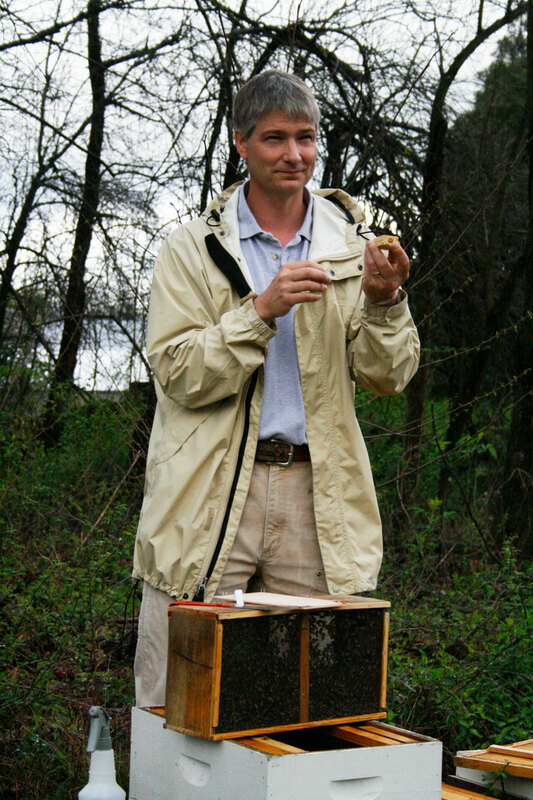 It found that colonies treated produced 85% fewer queens and were 8-12% smaller than untreated colonies. A third study looked at strawberries grown on conventional farms versus those grown on organic farms and the pollination success. It found that the organic farm had about 45% full pollination compared to 17% conventionally grown. While the study was not designed to answer the question why, they do discuss the possible higher abundance and increased diversity of the pollinators. The answers are out there. Be apart of the solution. Take the survey. 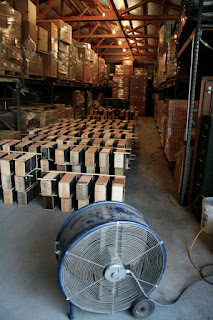 We have had two Bee Package pick up days thus far with another coming this Thursday (March 30, 2012). These days have been buzzing with exhilaration as customers pick up their packages of bees and watching the demonstration of an installation. 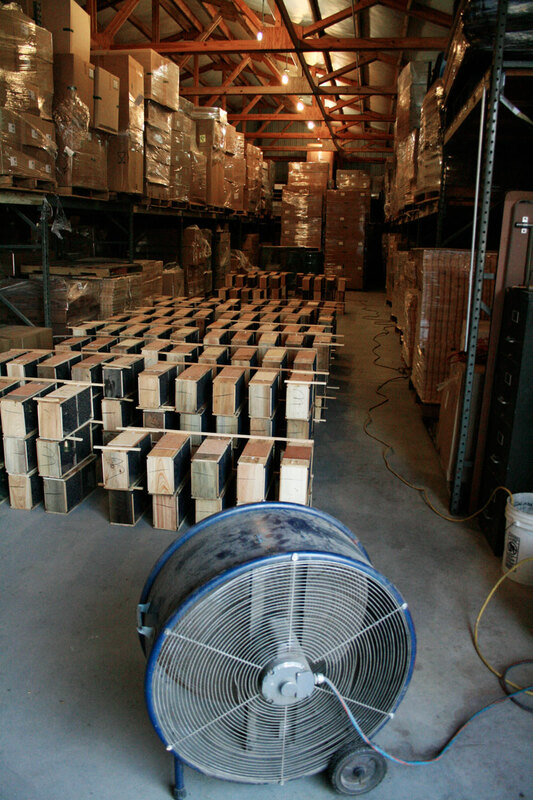 Having 300 packages of bees with two industrial fans keeping them cool was a great reason for customers and spectators to stop by the Bee Farm and see the excitement in the air. 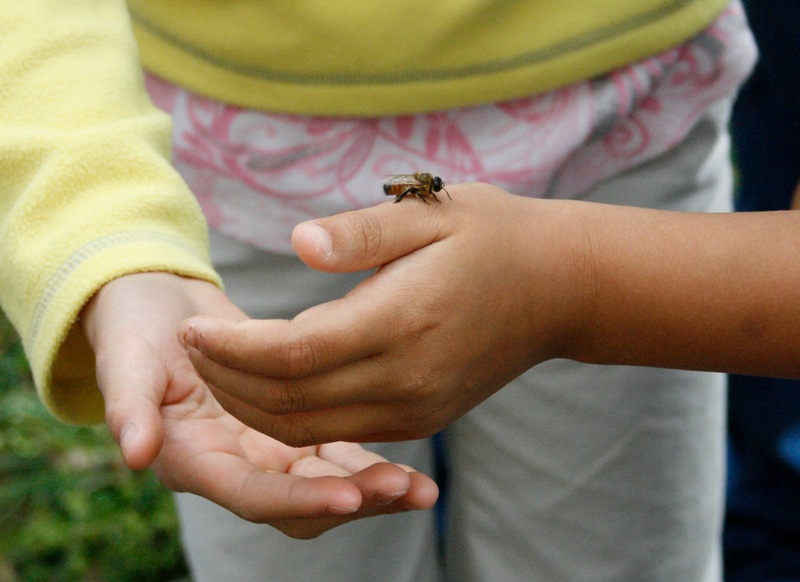 During the demonstration, spectators were able to overcome their fears and hold a bee as a Drone was passed around. This brought on many questions and an understanding of how harmless Honey Bees actually are. 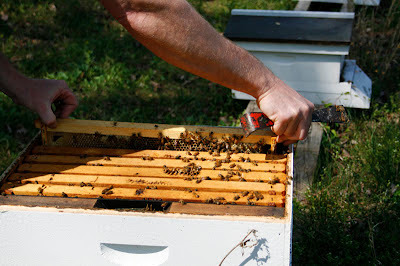 This is the first year that Brushy Mountain has offered NUCs for purchase and pick up. We will be holding a demonstration on each pick up day so if you are unfamiliar or unsure about the installation process of a NUC we welcome you and recommend you stay and ask questions. With such mild winter weather there have already been many reports of swarming. 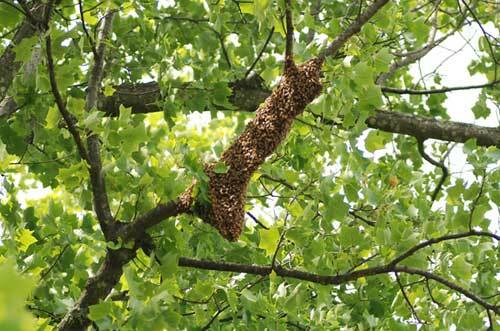 If you have come across a swarm or have been notified of a swarm and unsure on what to do, call your local Bee Association for assistance. There are many beekeepers that enjoy capturing swarms (mainly because they are FREE Bees), so do not hesitate to ask for assistance. 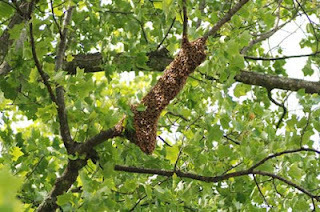 Swarms can be astounding and frightening in appearance but know that because the bees are not protecting any brood and are looking for a new home, they are not aggressive and can be harmless if they are not threatened. Swarming is a natural occurrence that produces a new colony of bees. During a swarm the old queen leaves with about half of the worker bees and it is caused by three primary factors: overcrowding of the hive, over heating with poor ventilation, or a lack of pheromone in the old queen. Swarming is a vulnerable time for the honey bee. Leaving the hive limits their food supply to what the bees can carry and leaves them unprotected from weather conditions. They will begin fairly close to the hive until they can scout a sustainable living space. The Bee Informed Partnership (BIP) is 5 year grant which is focused on reducing colony losses. There have been numerous projects before this one which have attempted to gain an understanding as to why we lose a 1/3 of our colonies each year; however, BIP is taking a very different approach. 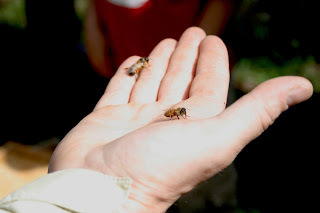 Their whole approach is to collect information from you, the beekeepers. Each year a survey is opened and beekeepers fill it out. The information is analysed to see what works and what doesn't. 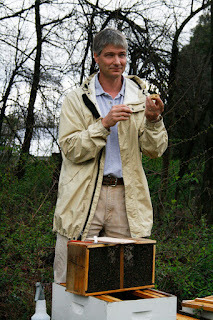 With more beekeepers participating, the better and more robust the results.